Butch Cassidy and the Sundance Kid is a 1969 American Western film directed by George Roy Hill and written by William Goldman (who won the Academy Award for Best Original Screenplay for the film). Based loosely on fact, the film tells the story of Wild West outlaws Robert LeRoy Parker, known as Butch Cassidy ( Paul Newman), and his partner Harry Longabaugh, the " Sundance Kid" ( Robert Redford), who are on the run from a crack US posse after a string of train robberies. The pair and Sundance's lover, Etta Place ( Katharine Ross), flee to Bolivia in search of a more successful criminal career. In 2003, the film was selected for the United States National Film Registry by the Library of Congress as being "culturally, historically, or aesthetically significant." The American Film Institute ranked Butch Cassidy and the Sundance Kid as the 73rd-greatest American film on its " AFI's 100 Years...100 Movies (10th Anniversary Edition)" list. Butch Cassidy and the Sundance Kid were ranked 20th greatest heroes on " AFI's 100 Years...100 Heroes and Villains". Butch Cassidy and the Sundance Kid was selected by the American Film Institute as the 7th greatest Western of all time in the AFI's 10 Top 10 list in 2008. In late 1890s Wyoming, Butch Cassidy is the affable, clever, talkative leader of the outlaw Hole in the Wall Gang. His closest companion is the laconic dead-shot " Sundance Kid". The two return to their hideout at Hole-in-the-Wall (Wyoming) to discover that the rest of the gang, irked at Butch's long absences, have selected Harvey Logan as their new leader. Butch and Sundance steal a payroll and the mules carrying it, and arrive in a small town. A boy recognizes the mules' brand and alerts the local police, leading to a gunfight with the outlaws. They take cover in a building but are both seriously wounded, after Butch makes a futile attempt to run to the mules in order to bring more ammunition, while Sundance provides cover fire. As dozens of Bolivian soldiers surround the area, Butch suggests the duo's next destination should be Australia. They charge out of the building guns blazing, directly into a firing squad as the image freezes to the sound of dozens of muskets firing repeatedly. The role of Sundance was offered to Jack Lemmon, whose production company, JML, had produced the film Cool Hand Luke (1967) starring Newman. Lemmon, however, turned down the role; he did not like riding horses, and he felt he had already played too many aspects of the Sundance Kid's character before. Other actors considered for the role of Sundance were Steve McQueen and Warren Beatty, who both turned it down, with Beatty claiming that the film was too similar to Bonnie and Clyde. According to Goldman, McQueen and Newman both read the scripts at the same time and agreed to do the film. McQueen eventually backed out of the film due to disagreements with Newman. The two actors would eventually team up in the 1974 disaster film The Towering Inferno. Time magazine said the film's two male stars are "afflicted with cinematic schizophrenia. One moment they are sinewy, battered remnants of a discarded tradition. The next they are low comedians whose chaffing relationship—and dialogue—could have been lifted from a Batman and Robin episode." Time also criticized the film's score as absurd and anachronistic. 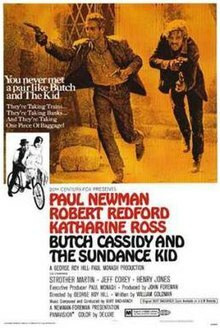 Butch Cassidy and the Sundance Kid was selected by the American Film Institute as the 7th greatest Western of all time in the AFI's 10 Top 10 list in 2008. In 1979 Butch and Sundance: The Early Days, a prequel, was released starring Tom Berenger as Butch Cassidy and William Katt as the Sundance Kid. It was directed by Richard Lester and written by Allan Burns. William Goldman, the Oscar-winning writer of the original film, was an executive producer. Jeff Corey was the only actor to appear in the original and the prequel. ^ "BUTCH CASSIDY AND THE SUNDANCE KID". British Board of Film Classification. Retrieved December 15, 2014. ^ "Butch Cassidy and the Sundance Kid – Box Office Data, DVD and Blu-ray Sales, Movie News, Cast and Crew Information". The Numbers. Retrieved December 15, 2014. ^ "Butch Cassidy and the Sundance Kid (1969)". Box Office Mojo. Retrieved February 26, 2012. ^ Goldman, William (1982). Adventures in the Screen Trade. pp. 191–200. ^ Nixon, Rob. "The Big Idea – Butch Cassidy and the Sundance Kid". Turner Classic Movies, Inc. Retrieved February 26, 2017. ^ Flynn, Bob (August 15, 1998). "A slice of Lemmon for extra character". The Canberra Time. Panorama. p. 7. ^ Tiffany Woo (October 26, 2009). "'Butch Cassidy' returns after 40 years". Yale Daily News. Archived from the original on October 2, 2012. Retrieved August 26, 2011. ^ "Butch Cassidy and the Sundance Kid". AFI website. Retrieved February 15, 2017. ^ "Big Rental Films of 1969". Variety. January 7, 1970. p. 15. ^ Silverman, Stephen M (1988). The Fox that got away : the last days of the Zanuck dynasty at Twentieth Century-Fox. L. Stuart. p. 328. ^ "Domestic Grosses Adjusted for Ticket Price Inflation". Box Office Mojo. Retrieved February 9, 2009. ^ "1970 Box Office in France". Box Office Story. ^ Goldman, William (2000). Which lie did I tell?, or, More adventures in the screen trade (1st ed.). New York: Pantheon Books. ISBN 0-375-40349-3. ^ "Double Vision". Time. September 26, 1969. Retrieved February 9, 2009. ^ "Butch Cassidy and the Sundance Kid". Chicago Sun-Times. October 13, 1969. ^ Savage, Sophia (February 27, 2013). "WGA Lists Greatest Screenplays, From 'Casablanca' and 'Godfather' to 'Memento' and 'Notorious'". Archived from the original on August 13, 2006. Retrieved February 28, 2013. ^ "Butch Cassidy and the Sundance Kid". Rotten Tomatoes. Retrieved September 17, 2012. ^ "The 42nd Academy Awards (1970) Nominees and Winners". oscars.org. Retrieved August 26, 2011. ^ "Butch Cassidy and the Sundance Kid: Awards". IMDB. Retrieved July 26, 2017. ^ "William Goldman – Awards & Nominations". awardsandwinners.com. ^ "Preserved Projects". Academy Film Archive. ^ "Alias Smith and Jones". Archived from the original on December 31, 2006. Retrieved 2006-12-09. ^ MAD #136 July 1970 at MAD cover site. Wikimedia Commons has media related to Butch Cassidy and the Sundance Kid.